The intent here is to assist you, the client, to understand just what in general terms that process means to me. For you, essentially a "Working with an Architect" to design a building discussion. For every project there is essentially the same Design Process. The building type varies, the property aspects are different, the client has varying tastes and the Architect his own style. Yet no matter the end result (which can be wildly different) the path to get there is similar. It should look something like this. This is an abbreviated example. 4 Car Garage. Could be 2-2 car garages if that works better. We also need lots of storage for bikes, etc. Gather up pictures and images of things you like from whatever sources you choose. Keep these to the point. Sometimes too much information and too many choices is not a positive thing. You've decided you want to build a new home. You've found a lot you really like and you have some ideas as to just how you want a house to fit and enhance your lifestyle. What is the next step? That's the focus of this page. 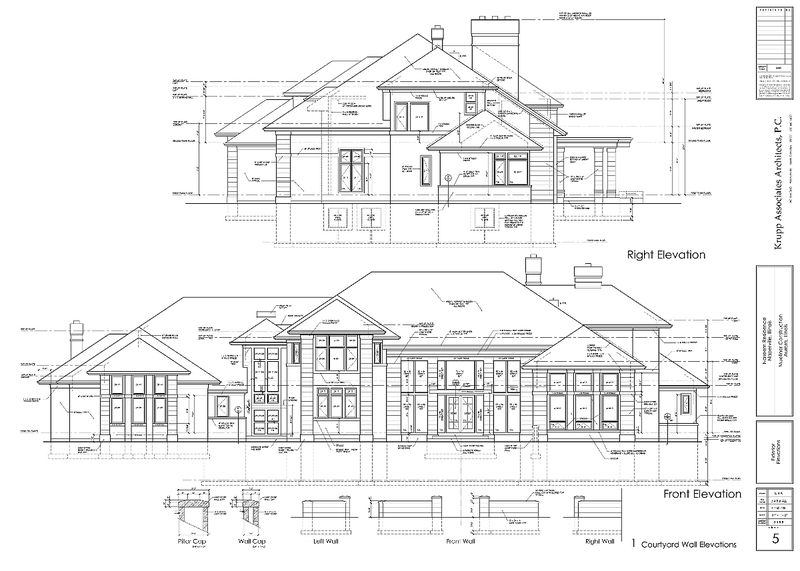 The topic is just how an architect will guide you though the design process and develop plans and drawings such that you get your ideal home on paper so you can approve the designs, achieve completion of construction drawings, get your project bid (priced) and obtain a permit so you can get the wonderful process of building and realizing your dream home in motion. Check your closing papers to see if you might already have this. If not, a surveyor should be engaged to create the survey for you. The architect's job at this stage is to organize your Wish List and analize the site in order to create the first round of drawings. The drawings below are representative of this phase. We will meet to discuss the designs. Several iterations may be required to reach a final design. This phase of the drawings begins with the approved Preliminary Design and further develops the project. 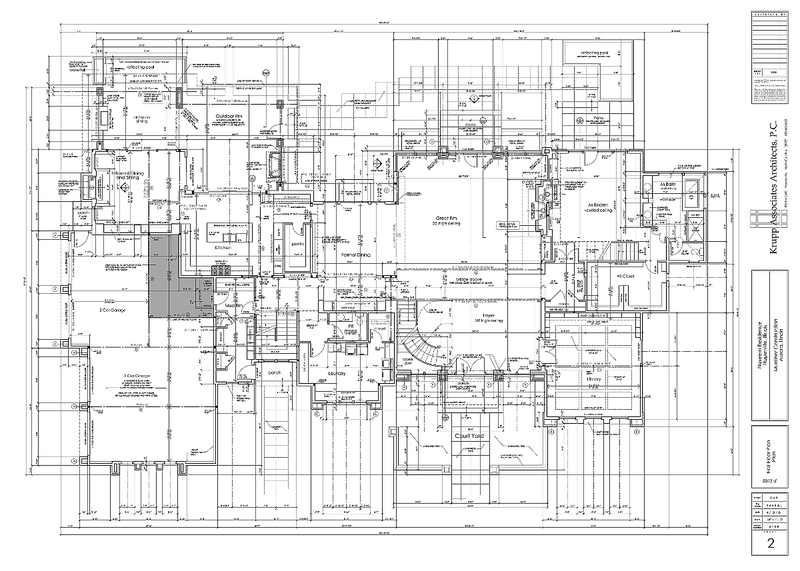 The number of drawings is expanded to include things like a roof plan, a basement plan, electrical and plumbing and a site plan with the house located on the lot. A budget should also be determined at this point. The architect and the builder (if selected) will help with this task. The building footprint and square footages will also be determined in this phase. 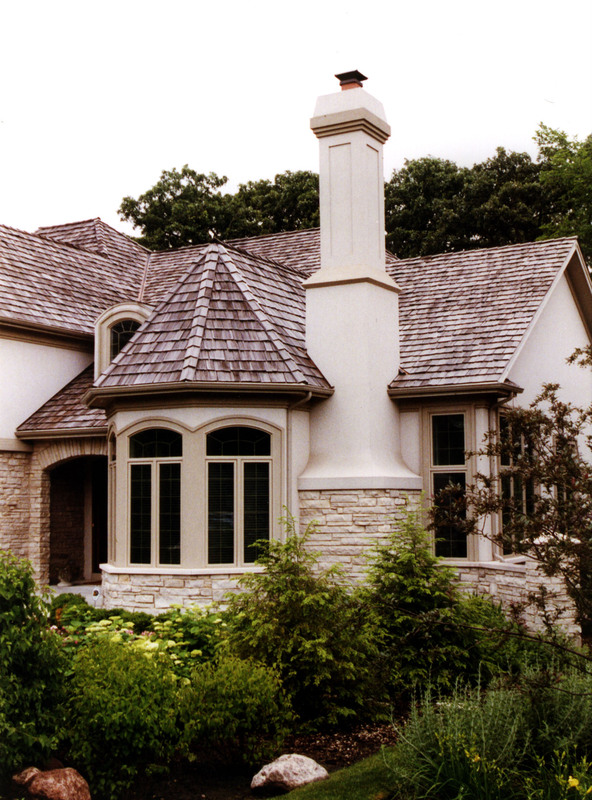 Exterior and interior materials will be discussed and selected if feasible. The selection of an interior designer and landscaper should also take place in order to fill out the design team. 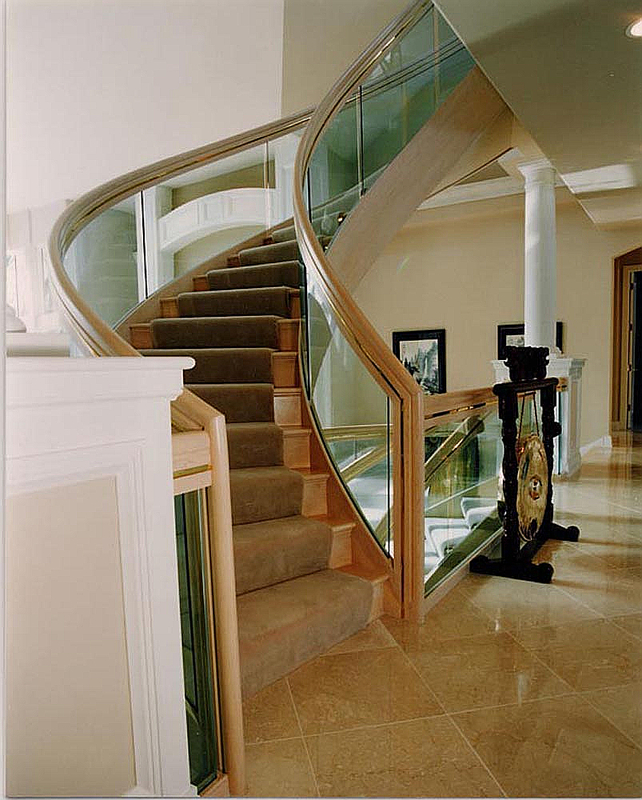 If you have decided on a builder you may want him them to do a preliminary quote as well. This is a good time to determine if we're staying on budget before the drawings are 100%. We'll begin this phase with the completed and approved Design Development Drawings. Prior to starting the Construction/Bid Drawings we will give you the drawings to take with you to do your final review and provide us with your written approval. Changes thereafter will be an additional charge. The Construction Drawings will be submitted for the necessary building permits. Once obtained, the construction of your new home can begin. Now, because we paid proper attention into creating quality drawings the construction should go smoothly with no unexpected surprises. Minimizing or maybe even eliminating additonal expense is our goal. 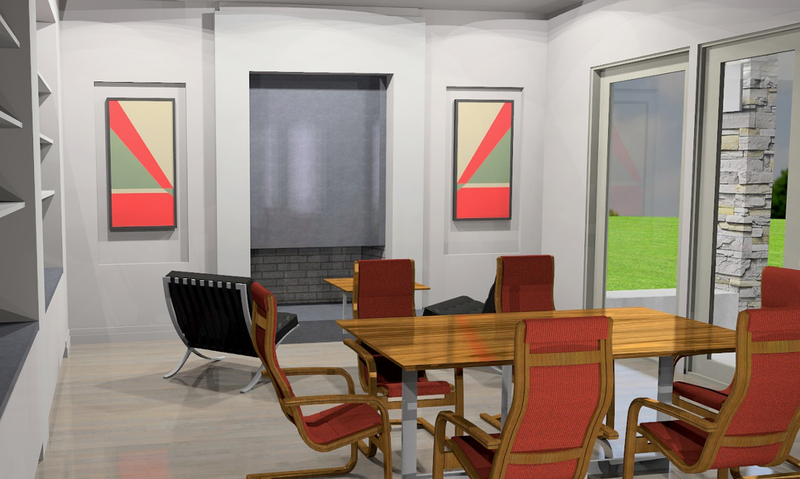 If you have elected to do so, we will provide you with a 3D fully rendered model of your new home. 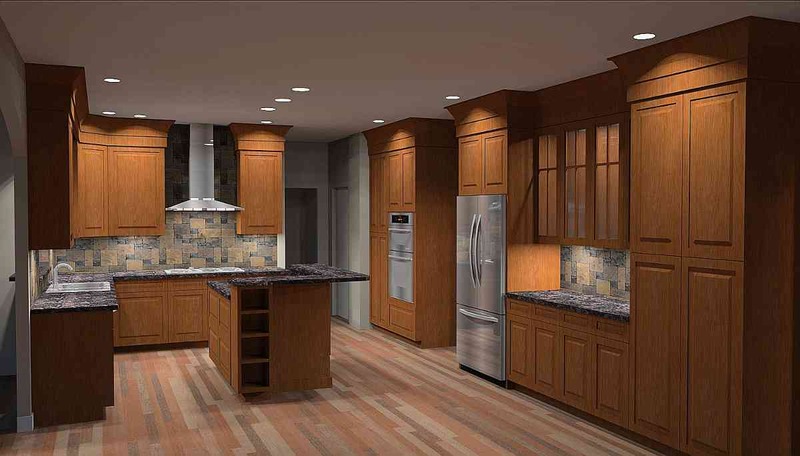 There is no better way to understand just what your home will be when everything is completed. 1. Pre-Design meeting where we can meet and talk in general about your home and I can tell you about myself and my practice - please bring your wish list and photos with you. We'll discuss your budget. 8. Engineered Site Plan will be co-ordinated with our work. Engage Landscape Architect if required. We have set a budget of $200 per sq ft. for the house only. We own the lot outright and will handle the landscaping, drives, walks and walls separately.